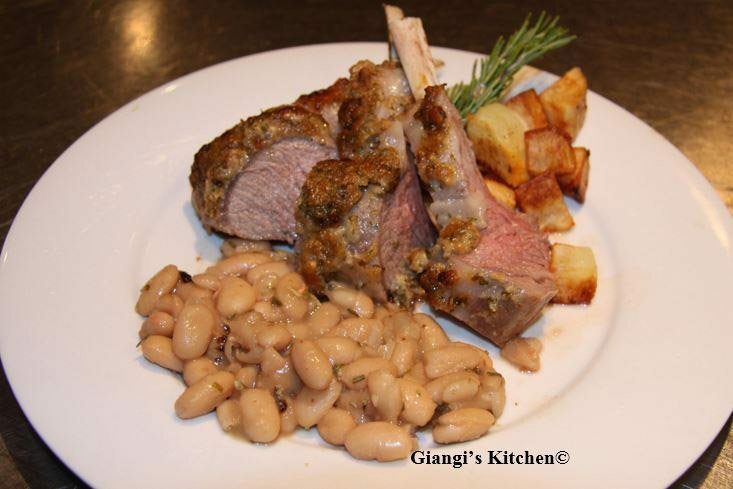 Herbs rack of lamb with white bean and rosemary ragout. Trying to add a new flavor during the week is rather challenging but not impossible. As you may have notice we are not beans eaters in our family, and as lamb was on the dinner menu, I wanted to prepare alongside something new. Browsing thru some old French cookbooks, I often saw lamb prepared with beans. Why not give it a try. The white bean recipe last night was a combination of three recipe books and created as I was looking at my ingredients that I had on hand and did not feel like going to the store to just purchase one ingredient. Kind of fun to see what you can get away with and still have a delicious easy meal prepared. Great family dish, enjoyed by all and no left overs. Stir together the mustard seeds, lemon juice, Dijon mustard, honey, bread crumbs, parsley, rosemary, and melted butter. Spread this mixture over the top of the rack of lamb. Place the lamb in a roasting pan and cook in the oven at 375° for 25 minutes. 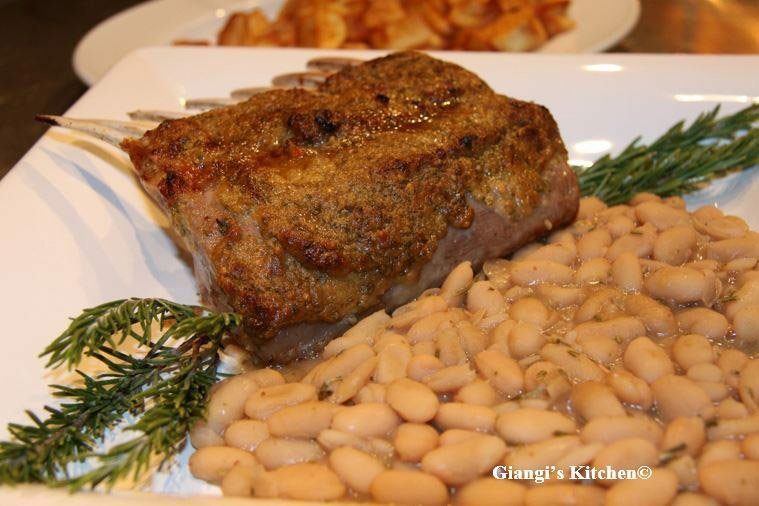 While the lamb is cooking prepare the white bean ragout. Combine the cannellini beans, ½ cup of their reserved juices, 1 tablespoon rosemary, the soup concentrate Knorr cube and the lemon zest in a saucepan. Bring the mixture to a simmer, stirring constantly. Reduce the heat to medium low and continue to simmer the ragout for 10 minutes. If the ragout becomes too thick, add 2 to 3 tablespoons of the reserved juices from the beans to restore the consistency. Remove the lamb from the oven, cover and let it rest for 5 minutes before serving.